Ha Giang is a beautiful city amidst stunning mountains but many travelers are unfamiliar with its flower season. This is a uniquely Vietnamese phenomenon not to be missed. 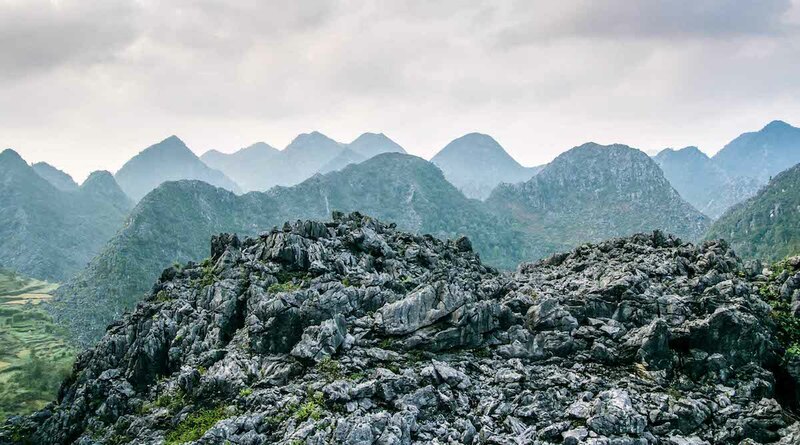 Ha Giang is known as the most beautiful place in Northern Vietnam. 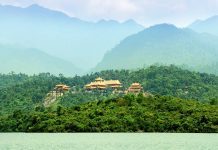 This province with its forested limestone and granite mountains, caves and gorgeous rivers, and tiny settlements, borders China. This province is as picturesque as can be. 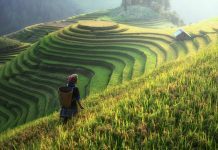 There are so many things to see in this stunningly scenic province – not only is it mountainous literally everywhere but some noted places are Ma Pi Leng Pass, Dong Van Plateau, and Hoang Su Phi. 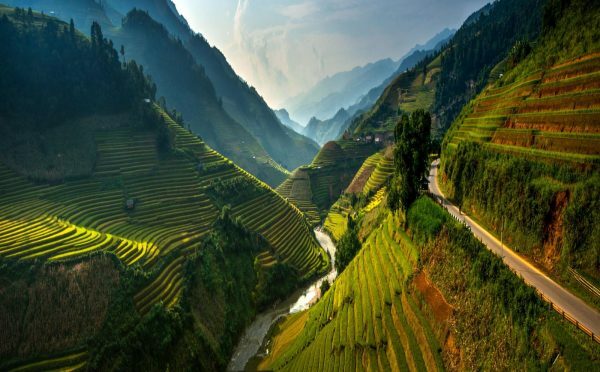 Quan Ba Pass, known for its panoramic views over terraced rice fields below, is located only 50 kilometers from the capital city of Ha Giang, also named Ha Giang. But this blog is not about the province itself. You can expect one later, but right now I am focusing on something special about Ha Giang – buckwheat flowers (Tam Giac Mach in Vietnamese). This will be your all-you-need-to-know about the buckwheat flower season in Ha Giang! They say that buckwheat blossoms, or “chez” as known by the H’mong (a local hill tribe of the North), are the specialty of the northernmost land, because every year, just when the first monsoon starts blowing, these tiny white flowers simultaneously flourish, flooding the whole rocky plateau. Carrying a legend that not everyone knows, buckwheat flowers adorn what we in Vietnam call “cat ear-shaped” stones with warm incarnadine, inviting the nomads to discover such captivating beauty. There are two types of buckwheat flowers. In areas of Cao Bang, you can find the white buds. Meanwhile, in Ha Giang, people often plant the purple buckwheat flower. Simple but loveable, modest but charming, buckwheat is harmonious with the green color of the forest and the grey color of the mountains which together creates an endless source of inspiration for art enthusiasts. But the most profound and beautiful feature of the flower is its meaning – slender in shape but full of energy and beauty, always overcoming the fierce challenges of nature. As autumn reaches its end, the flowers become more splendid and attractive. With time, they will start to change color from white to purple-pink, and finally dark red. The white one is usually grown in several areas of Cao Bang. Meanwhile in Ha Giang, people often plant the purple buckwheat flower. 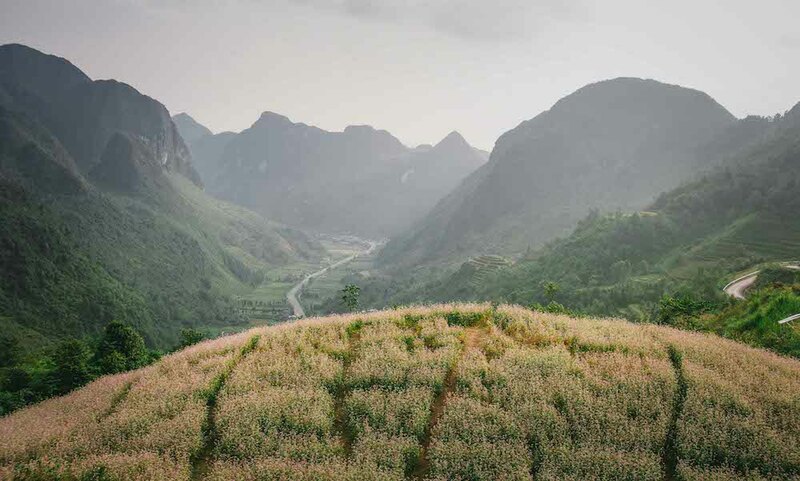 In order to promote the tourism potential of the region, Ha Giang authorities decided to increase the amount of buckwheat flower fields to attract more visitors. Every year, around October and November, there is a buckwheat flower festival in Ha Giang, which features art performances and displays of buckwheat flower products (such as buckwheat flower bouquets, buckwheat flower cakes and other dishes, buckwheat flower paintings and art, buckwheat flower tea, etc) in order to celebrate the blossoming of these iconic flowers in Dong Van District in Ha Giang Province. This annual festival has been bewitching flower lovers, couples as well as photography enthusiasts year after year. Buckwheat is often considered a tasty and healthier alternative to wheat. When harvested, the crops can be ground into flour and many parts of the world do this, such as India, Japan, and Korea. Rice, porridge, noodles, bread, pancakes, cookies, cakes, can all be made from buckwheat flour. The young buckwheat flower stem can also be boiled and used as vegetables, or it can be cooked with wine and corn to brew a very unique type of wine. It also has medicinal benefits and is sometimes used in cattle feed. The flowers of the buckwheat plant have a pleasant fragrance and taste quite malty and earthy. The flowers are used for manufacturing dark brown-colored honey that is quite strong in flavor. Buckwheat has many nutritional benefits and is a good source of high-quality protein that is easy to digest. The buckwheat starch acts as fat in processed foods, which is why it is used in baking. The benefits go on. It lowers blood pressure as it is a good source of rutin, it’s non-allergenic (stuffed into pillows to help cure dust, feather, and pollen allergies), helps manage diabetes, it’s good for digestion, it’s gluten-free, reduces cholesterol, lowers blood sugar levels, protects against breast cancer, benefits the skin and hair, among many other things. If you are curious to know about more health benefits of the buckwheat flower, click here. It is said that this tiny flower forest with green leaves once saved a whole village from a severe famine that occurred when the old harvest season ended way before the new one arrived. According to the legend, in the past, the people in the Northern mountainous region lived mainly on rice and corn. One year, the food ran out and the land became barren, and the local people had to wander in search of food. Then, a strange yet pleasant fragrance filled the atmosphere and attracted the peasants to a ravine. Among the rocks, they discovered small white-pink flowers whose nuts tasted as subtle as rice and corn. Since then, the Hmong have used the buckwheat nuts as staples like maize and rice. 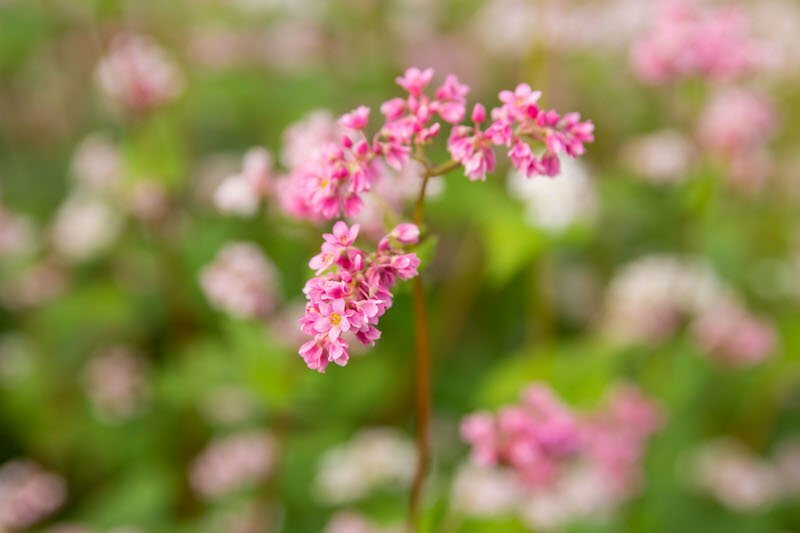 The buckwheat flower then became an essential part of their daily lives. If you set foot in Ha Giang at the end of autumn (September to November) and even December, you will have a chance to experience the magic of the dreamy pink buckwheat fields stretching across the hills. From Ha Giang town, the Happiness road will lead you to the land of buckwheat flowers. The Dong Van Highland blooms with buckwheat flowers during November and December, over the mountainside, across villages and fields, passing through the legendary Ma Pi Leng saddle, creating a plateau of pink color. The beauty of nature, climate, and ecology all together bring soothing emotions and relaxation in the heart of visitors. It is a romantic escape, even for those who deem themselves non-romantic. Thach Son Than (Quyet Tien town, Quan Ba District): the buckwheat fields are on the road to Quan Ba, about three kilometers from Bac Sum hill. This place offers adorable swings as well as lovely miniature houses and other decorative items to photograph. Newly married couples often flock to this location to enjoy the heart-touching moments with the gorgeous color of the buckwheat flowers. Ticket price: 10,000 VND/ticket. Lung Cam Cultural Village (Sung La-Dong Van Valley): This is where you can see the most flowers. 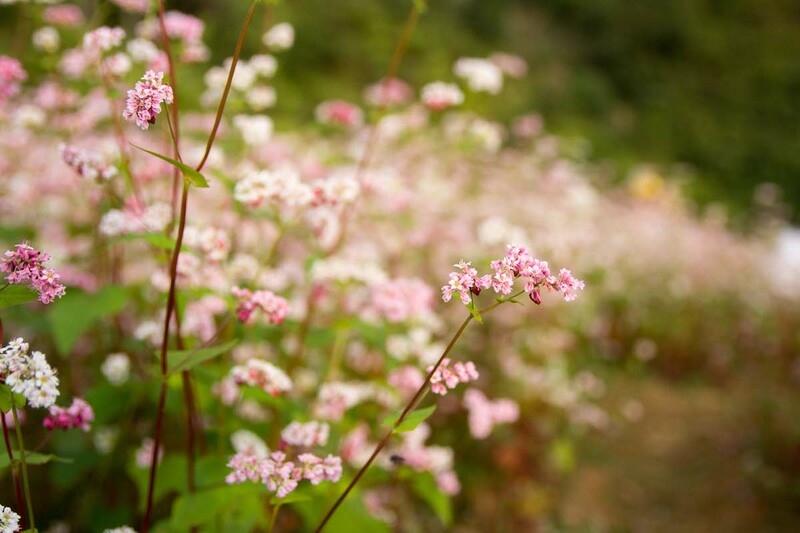 It is also the best place to fully immerse yourself in the beauty of buckwheat flowers. In addition, Sung La also has the house of Pao and many fascinating rose gardens. Ma Pi Leng Pass: the buckwheat field lies between two mountain ranges, which creates a stunning natural landscape. Because the people here start to sow the seeds later than those in Dong Van Valley normally do, not until mid-October do the flowers begin to wear a pinkish color and then become most stunning when November comes by. The field under the Lung Cu Flagpole: At the foot of Lung Cu flagpole you can find many buckwheat flowers. The flowers are grown in extremely eye-catching terraced fields giving tourists the most unforgettable scene of their life. Fun fact: The Lung Cu flagpole marks the extreme North of Vietnam. This northernmost point marks the border between China and Vietnam. Other locations to witness the endless fields of buckwheat flowers in Ha Giang are Pha Cao, Dong Van, Ma Le, Hoang Su Phi, Xin Man, and Pho Bang. 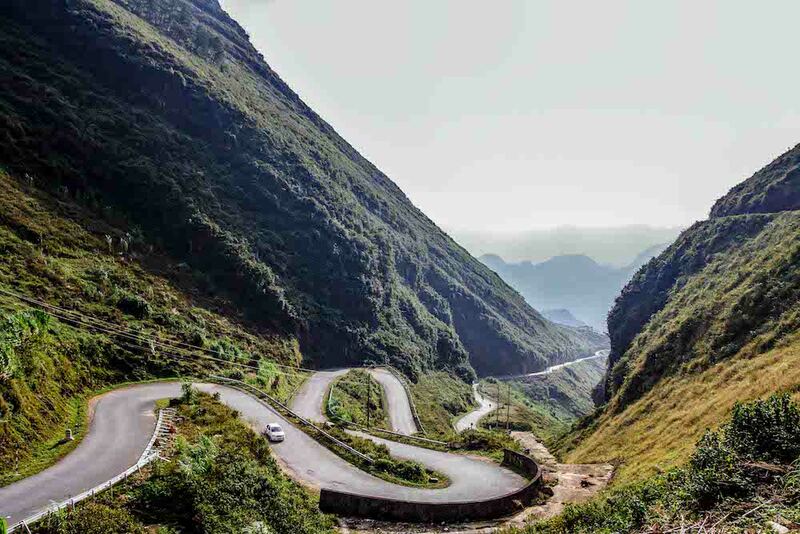 You can travel to Ha Giang by bus or motorbike. However, taking a motorbike is the better option. This enables travelers to admire all the scenery and landscape of the stone highland more freely. 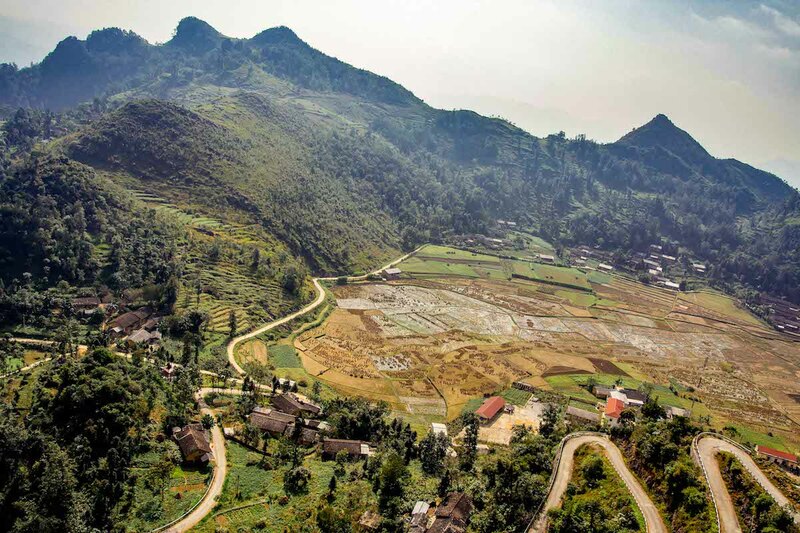 You can travel to Ha Giang city by bus and then hire the motorbike to visit some travel sites in Ha Giang as well. If you travel by motorbike, you need to bring along a repair kit including a tire and tube in case something goes wrong and there is no repair shop nearby. From Hanoi, you can catch buses leaving the My Dinh bus station (which is ten kilometers, six miles west of Hoàn Kiếm Lake). The day buses start at 5:30 AM until 12:30 PM with close to hourly departures, and the night buses begin departing from 6:00 PM until 9:30 PM. Both the day and night buses have sleeping couches with no toilets inside. The bus journey takes roughly six hours with one mid-way stop. If your bus reaches Ha Giang in the wee hours of the morning, you can sleep inside until dawn. It’s often cold at night and in the early morning, hence, remember to also bring a warm jacket. This is also helpful if you take the sleeper buses as people often describe them as moving refrigerators. Plus, during buckwheat season, the winds get quite chilly. So a good windbreaker will make you happy. You should book your hotel early in case they run out of rooms. The prices for some services in Ha Giang are usually higher than those in other places. Popular hostels include Ha Giang Cotton Hostel, Du Gia Backpacker Hostel, and KiKi’s House Hostel. You can click here for more. Some delicacies that you should not miss are mèn mén, corn cake, corn wine, and thắng cố, etc. Remember to try all those buckwheat delicacies! You should ask the owners of the fields for permission before wandering in these buckwheat flower fields. Do not tread on flowers and remember to pick up trash before leaving. Keep our beloved Vietnam clean! Trust me, it could be your biggest regret to miss a chance to watch one of the most romantic spectacles of the year. Come to Ha Giang, embrace the beautiful white and pink gowns of buckwheat flowers and let your soul free. Let us know when you fall in love with the place. If you enjoyed this article and want more fun travel tips, visit Christina’s Blog to learn about things you can see, do, and eat! Hi Thuong! I plan to visit the buckwheat fields sometime between July-August 2017. Can I still watch the blooms? The blooming starts in October and peaks in November. Hello, Looks beautiful. Would you be able to see the blooms in mid to late October? Do you have any tour companies you can recommend providing a private driver and guide? A motorbike is not an option for us. Thank you so much. Could you let me know any tour company for this buckwheat flower trip? Plan to travel to Hanoi Oct. 20th. Where is that first picture taken?? I know it says all of the province is that stunning but i’d love to know where this is! thanks!